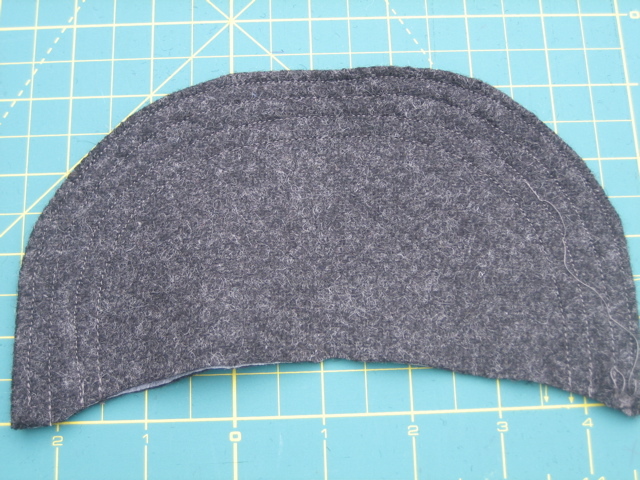 In this tutorial, I will be sewing a cap which will fit a 4-6 year old. 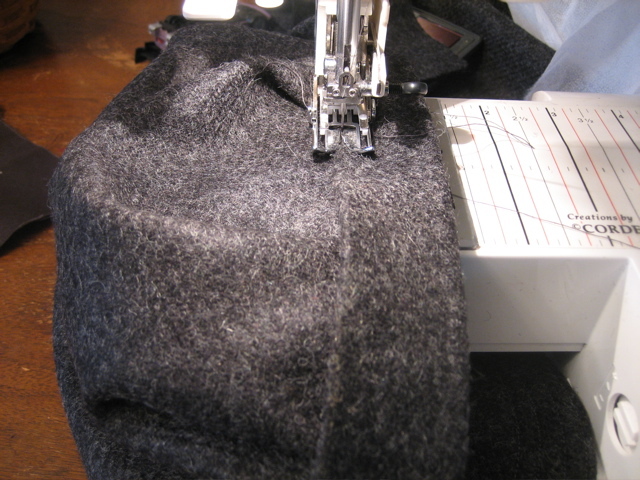 I will try to point out the steps that you will need to adjust if you are making a smaller or larger cap. 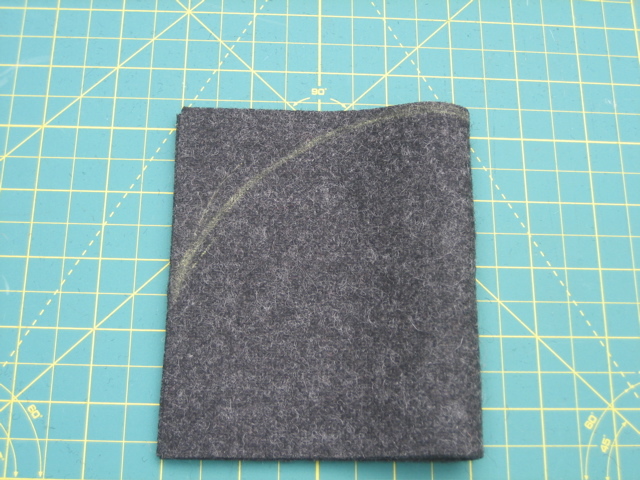 A little less than ½ yard medium to heavy weight cotton, canvas or as in this tutorial, I used wool. Seam allowances are ½” unless directed otherwise. This tutorial is meant for personal use. Please do not sell Eddie Caps made from this tutorial. 1. Measure the largest part of the head for your cap to get your circumference. For my boys, their heads are about 21″. Cut two bands– the length of both bands will be the circumference of your head + 1″ ease + 1″ seam allowances. So for my hats, it was 21″ + 1″ + 1″ = 23″ inches for my band lengths. For the widths, one band should be 2″ x 23″ for the inside of the cap and the other should measure 2 ½” x 23″ for the outside band. 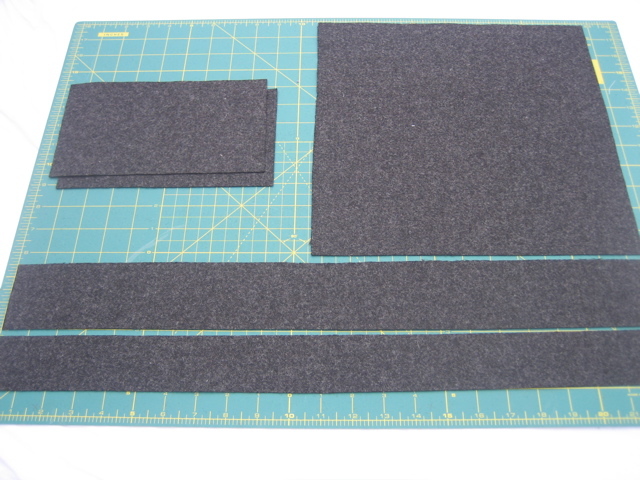 Cut two rectangles measuring 8½” x 5″. Measure 3½” in both horizontally and vertically from each corner and mark. Connect your marks at each corner using your ruler to form a triangle. Check your work to be sure all your sides will be about 5″ before cutting. Cut off triangles at each corner. Viola! You have your octagon. Please note that this is not a “perfect” octagon, but that it’s sides are about 5″. Stack you rectangles making sure everything is lined up. Fold rectangles in half long-wise so that it measures 4¼” x 5″. 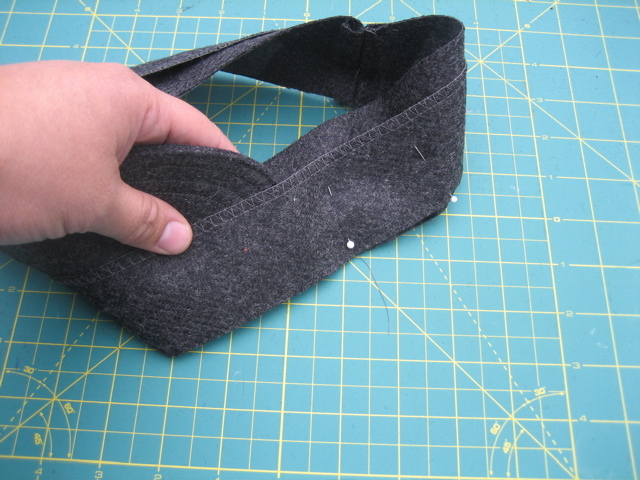 Draw a wide curve starting about 2 inches up from the bottom at the side edge and ending at the top of the fold. Open and make any adjustments for the shape of bill you desire. 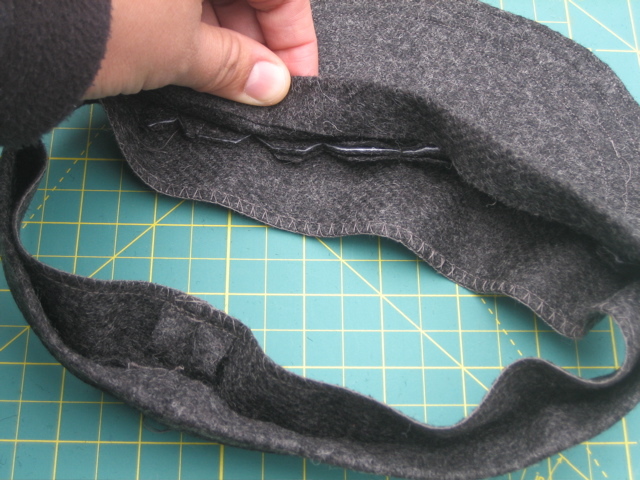 With right sides together, stitch around outside curved edge leaving the bottom straight edge open. 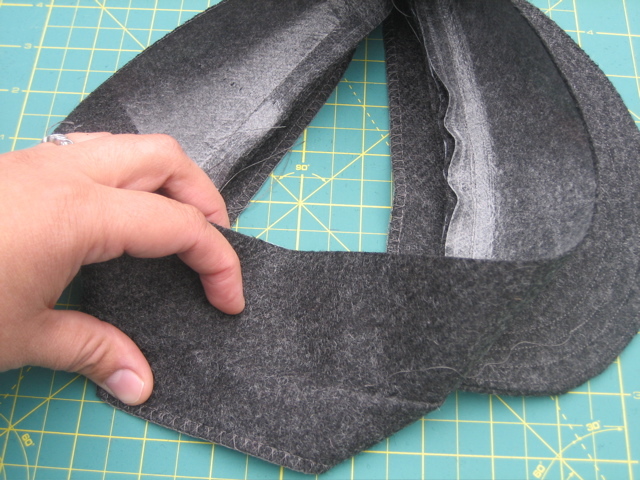 Trim seam and clip at curves. Cut a curve across bottom open edge to somewhat match the top curve of the bill and set aside. * After making these a few more times, I’ve found that you should be cutting off a lot here. In the middle of the bill- the middle of your arch, the bill should only measure about 3″ wide and 4″ wide at the ends. Otherwise, your bill will be too long and floppy. Sew each band together at sides to make 2 circles. Press seams open. 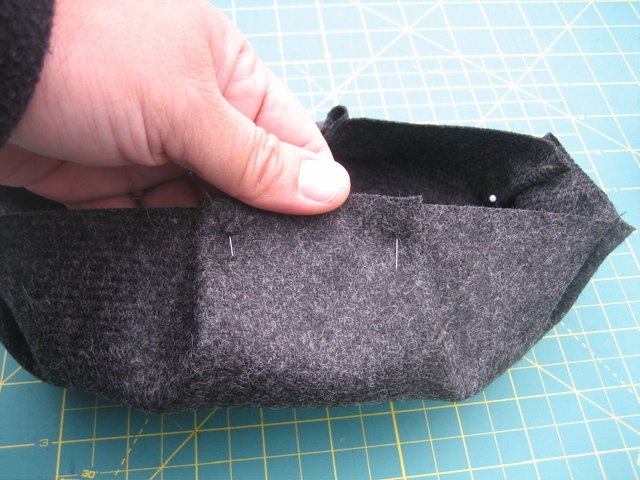 Be sure right sides are together and for the interfaced band, the interfacing should be on the inside. Overcast, zigzag or pink along one long edge of the 2″ x 23″ Inside band. 7. Next, find your bill and baste bill to interfaced band, right sides together, making sure the band seam is in the back. In this photo above, the bands are pinned with right sides together. 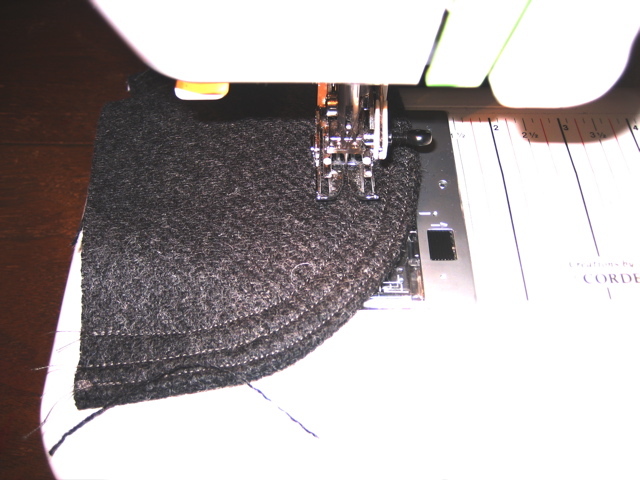 Your seam should be at the bottom edge where the pin heads are in the photo. Don’t worry if the bands don’t fit together perfectly so don’t do any trimming! When you sew them together, it all works out and it fits. 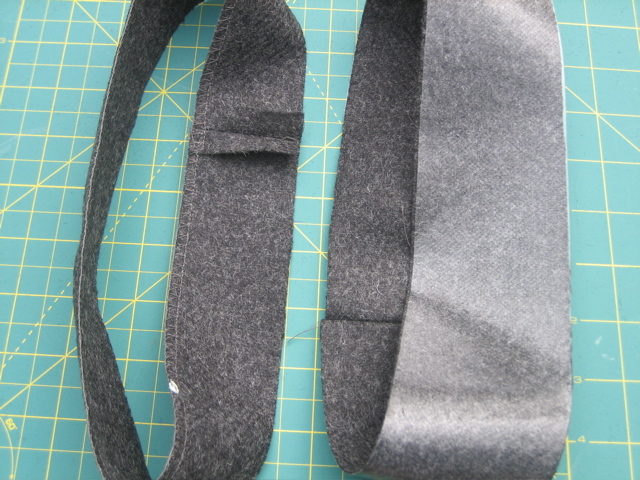 Here you see the bands are stitched together, but the Inside finished edge is free. 9. 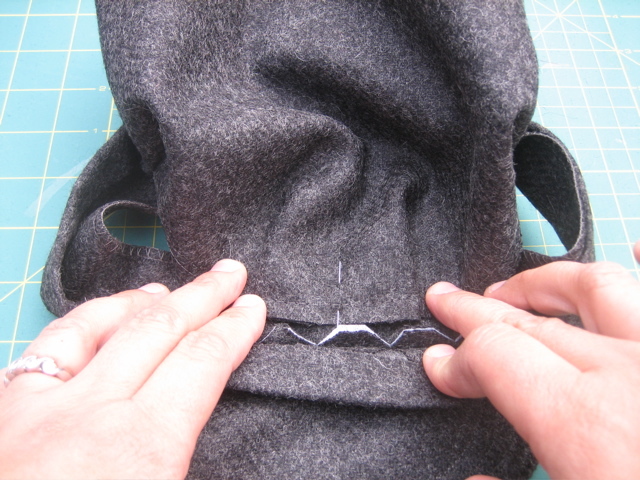 Clip curve at bill and press seam together. 10. 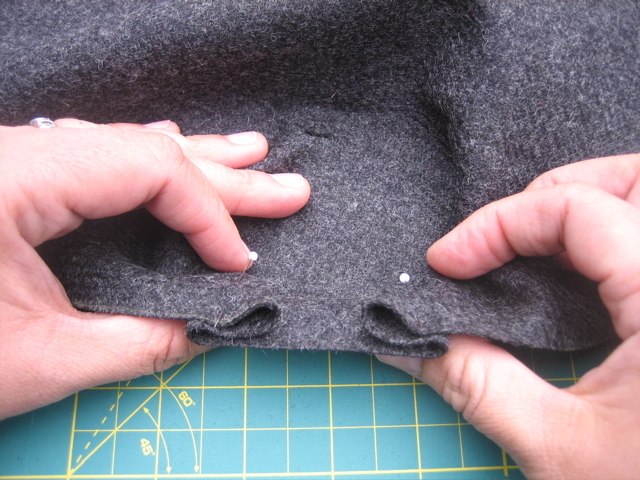 Press Outside band folding down 1/2″ to form hem at the top of the band. 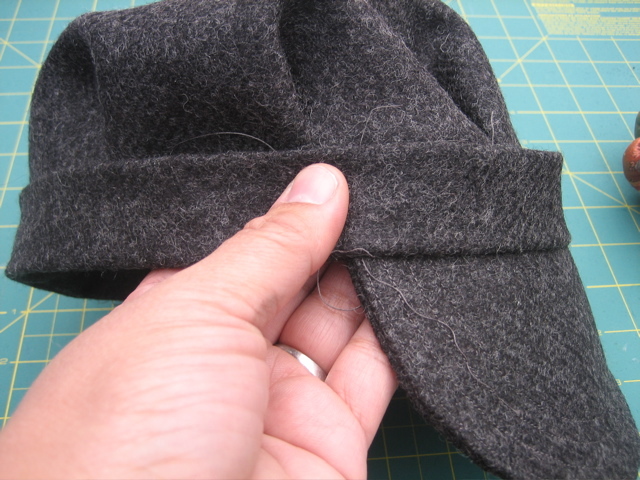 Be sure that the Inside finished edge extends a little beyond the folded Outside band so that it can be easily stitched down with the top of cap. 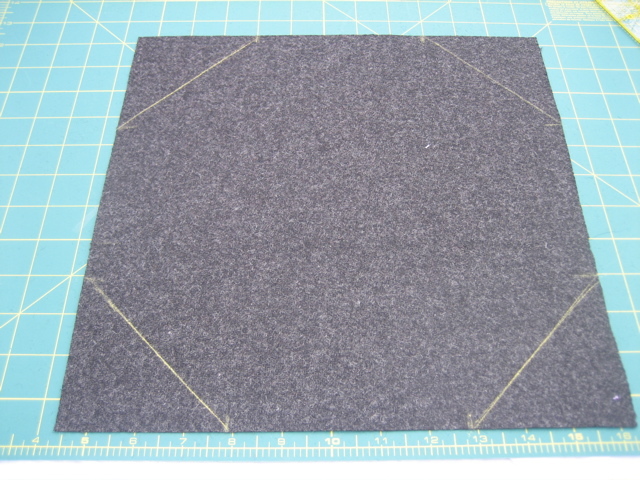 Starting at one edge of the octagon with the wrong side facing up, fold in point 1″ matching bottom edges. 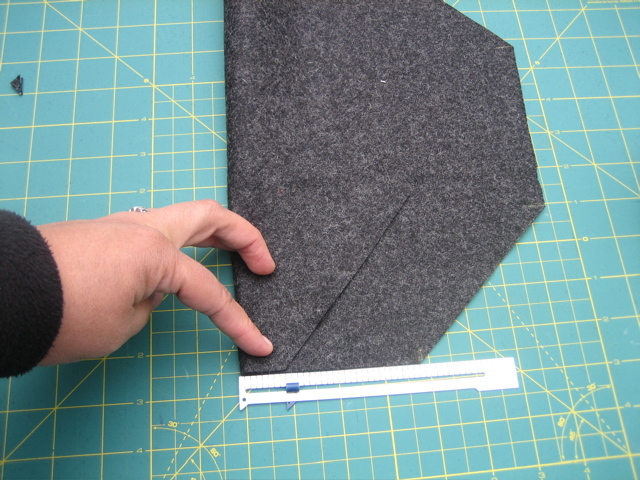 Now fold the top back, keeping the edges lined up and pin. Now fold the other side. 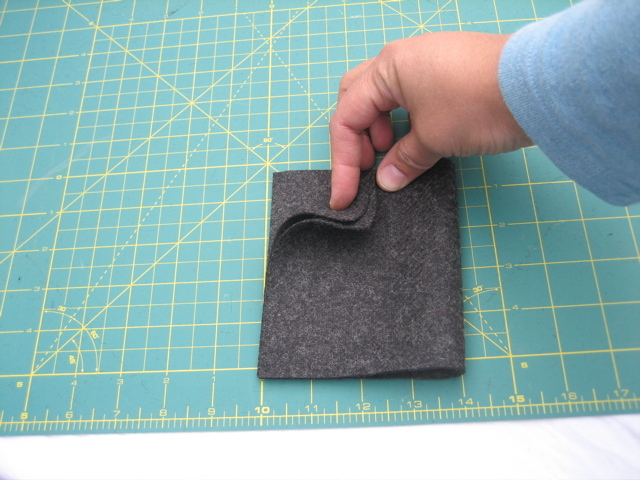 To be sure you have it right, once it’s folded and pined, the edge should form a curved edge. Also, the inside folds should look like a “V” and the outside should have two straight pleats. 12. Now, baste the top of cap to the inside finished edge of the band, but be sure that the front pleat is lined up with the middle of the bill or else it will look funky if it’s off. 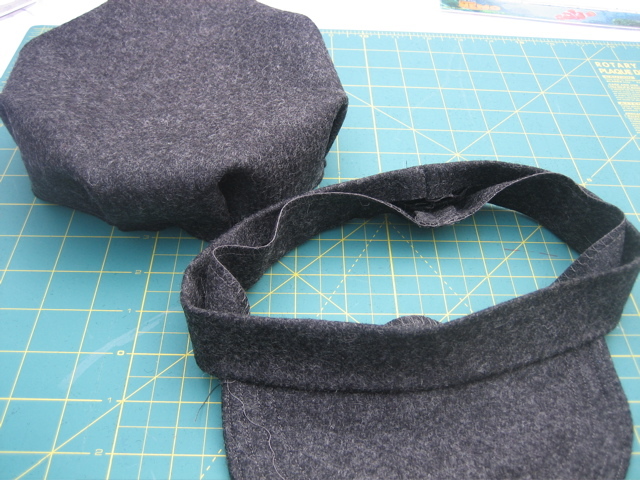 Start sewing in the front of the cap and work around in each direction ending at the back seams. 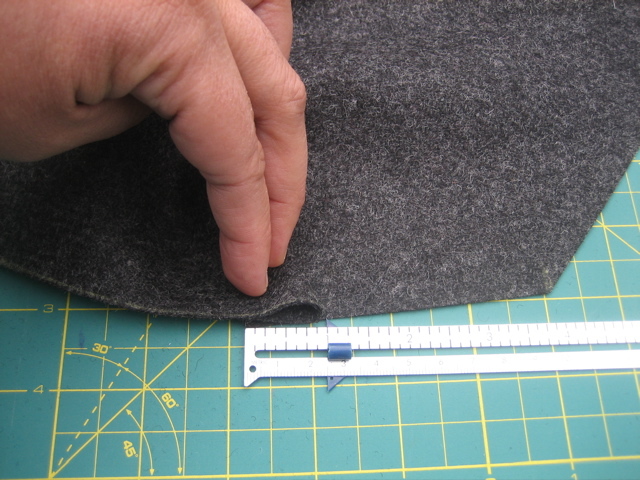 This is when you may need to do some adjusting of the back pleats to fit your cap top into your band. 13. Once everything fits good and there’s no puckering, fold over outside band and topstitch all layers with the outside band on top. 14. 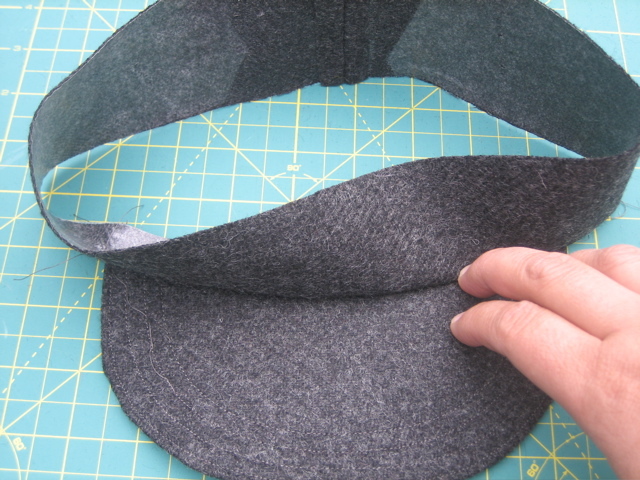 Check all your seams for any puckering or missed edges and try it on. 15. And finally, find a comfy spot to sit, get your sharp seam ripper, and take out the basting stitches on the inside of the cap. Now take a picture of your cutie in his (or her) cap and post it on Flickr’s “Eddie Cap” group for all of us to admire. Great tutorial of such an adorable hat! The only thing I would do different would be on Step 5…I’d use a double needle and an edge stitching foot so my topstitching would come out parallel. Thanks so much for sharing! You rock! lisa, love the hat, and my little Owen can’t wait to wear his when he plays with Thomas. 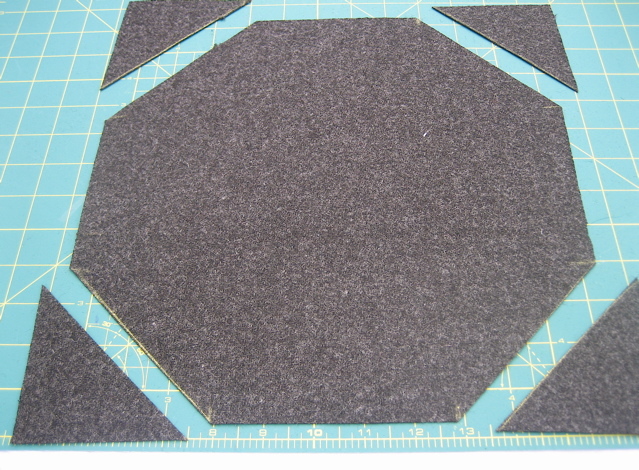 You pattern is based on a hexagon not an octagon….. and we thought high school geometry would never be used! Ha…. you threw me there for a minute. Looks like an octagon to me – eight sides. A hexagon has six sides. Time for a geometry review? Oh my goodness! Such of a wonderful hat but also an awesome tutorial! Very well written. I’ll have to give this hat a try. Thank you very much! Thank you very much, I’ll try it as soon as I buy some wool. I think this will be an immediate project! thank you! Oh my – this is ADORABLE! Thank you for sharing! Thanks for providing such an easy to follow tutorial. I wonder if my sewing skills can handle something as cool as this! Sooo so so cute! I want to make a pink one for my little girl! Thanks for the tutorial! I love this hat, I don’t know If I am up to it but my little guy would look Darling! I thank you for sharing! So cute! I posted a link on my blog. Great tutorial–never guess you’re a beginning sewer! Cute hat and adorable little guy. Good job! oh. my. goodness. TOO CUTE! thanks for the tut! What a great tutorial! 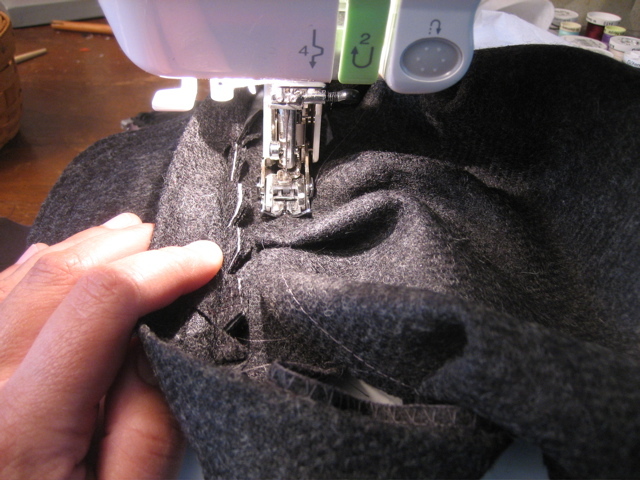 Just getting back into sewing… or trying to anyways…. so thanks for some much needed inspiration! I want to make one for myself in florals!! Thank you so much for the tutorial. I bookmarked it now can’t wait to make it…maybe this summer?? Wow, its really hard to believe you’re a “new sewer”…really great project and such a cute result. Massive kudos to you!! I am definitely adding this to my project list. My baby is only 6 months old, but I think he needs an Eddie cap. absolutely adorable! I think I need one for me! this is great. can’t wait to try it. thanks for sharing. your son is a cutie! i just made this for little man and i am so excited! i was a little impatient to get it finished so at the end when it was a little big i just took in the back pleats more rather than going around and adjusting them all. it’s really fine this way though and next time i know to size it a bit smaller. as long as no one examines the back of his hat up close though they’ll never know the difference! my camera is broken so pictures will have to wait until tomorrow, but i couldn’t wait to share…thanks! I just decided to make this for a present for my 8 year-old daughter’s friend. But my daughter is very small for her age and I decided not to trust her measurements for a normal size kid. So I took some measurements around the family. 6 year-old’s head circumfrence–21″, 12 year-old–21″, 33 year-old–22 1/4″! Weird. I guess heads don’t grow very much after a certain point. Which makes this tute even better because I don’t have to worry about fiddling with the recommended dimensions! Hi, I just made this today. I had a bit of trouble due to my lack of a walking foot. I have two more to make though, so I hope to do better next time. 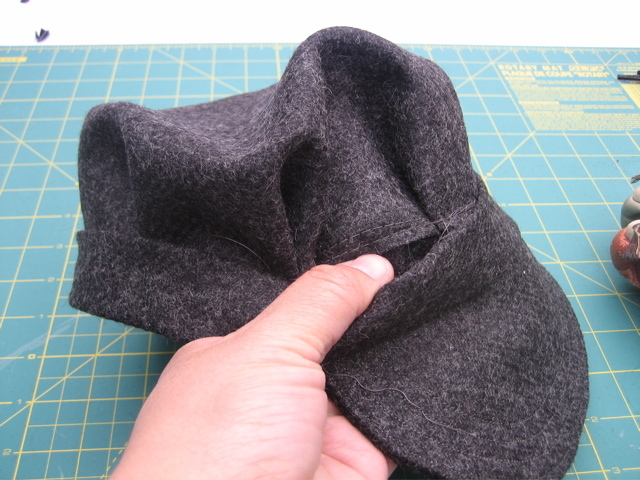 I have a old wool coat wanting to be made into a hat! How precious! The hat and Eddie! 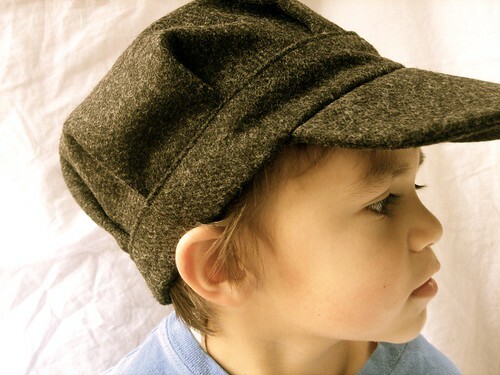 I’ve been looking all over for this, finding only knit instructions, so can’t wait to try in soft fabric for “newsboy” caps for my toddler granddaughters. They want ones like their teen cousins wear backwards! So you might post a photo of a “girlie” one. 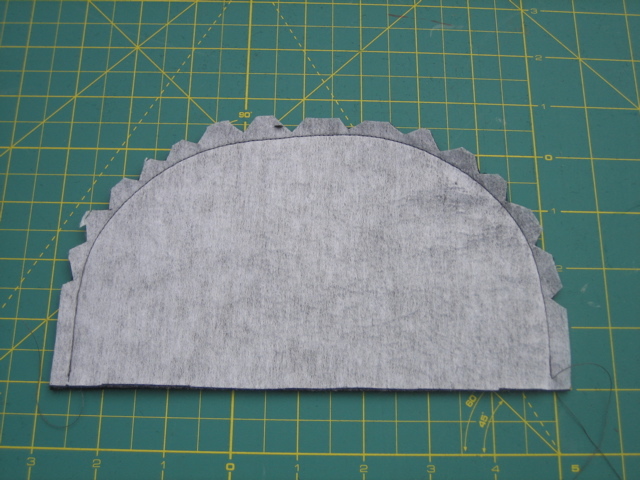 Would you put in a heavy interfacing for a softer fabric brim and maybe make longer and less deep for girl? 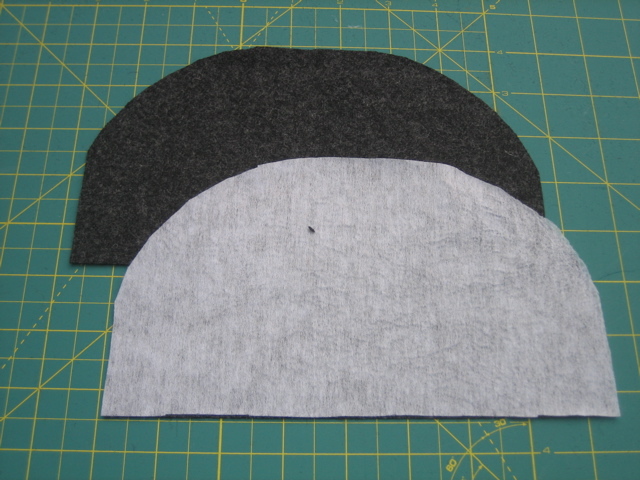 I did exactly that, I shortened the brim and used lighter fabric with interfacing. I also used 2 12×12 basted together wrong sides together with interfacing in between the 2 layers so the lining would not show interfacing. Works well. Walking foot would have been useful. Lighter fabric tends to stretch a little around the brim, you may want to interface both of the lining pieces to help prevent the stretch. Bonjour, Super contente d’avoir trouvé (grâce à ma soeur) ce tutoriel que je vais m’empresser de faire pour ma fille aînée ! Hello, very happy to find this tutorial. I will do a cap to my first girl ! So dang cute! I’m going to have to try this! Thanks for sharing. I love this hat!!! It looks super cute and fairly easy to make. I will be getting some supplies this week to get it done. I thought your tutorial was great! and the pictures really help to explain what needs to be done. Just wanted to thank you for the very clearly written and demonstrated tutorial. I made the hat, and it turned out great. Even the tricky parts were so well explained that it made the project easy. ¡¡Oh!! It is wonderful!! Thank you very much. Hugs from Spain. This is such a cute hat. It’s going right to the top of my list of projects! I finally made this, have wanted to for such a long time. Thank you for the great tutorial, I used old jeans to make mine and it came out adorable. I will post a picture just as soon as I can get it on my grandson’s head. Now I want to make another one! awesome tute, I think my nieces will be getting hats like this as part of their road trip 2010 bags, along with a matching outfit of course:) I see it now, peasant blouse, capri’s and an Eddie hat! Oh, what an awesome tutorial!!! I am a beginning sewer but with your tute I feel confident that I can do this Eddie cap, too; thank you so much! Great tutorial, simple and easy to follow, thanks so much! I’ve been wanting for a long time (they seem to be a bit overpriced in the shops up to 75€). I recycled an old pair of jeans for it. It was such a success that I have done another one for my friend and my parents have already put an ‘order’ in to have one too…. I sew mostly costume-level outfits and needed an engineer’s hat to complete my “El Conductor” outfit. (I support our city’s semi-pro soccer team by attending matches in costume). Thank you for the easy-to-follow instructional. Thank you for this GREAT web page, my son is having his 5th birthday in December and this should be quick to put together for his party which we are having at a ride on scale model train park. I’m going to make one for all his friends invited too. could you make a tutorial for the original newsboy cap? i’ve searched all over for patterns but couldn’t find any. 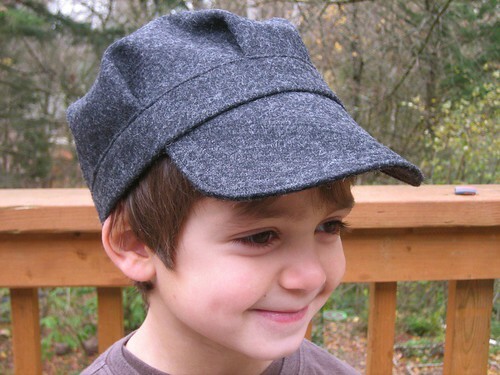 Super, I have been looking for a hat pattern like this one. Great tutorial. Thanks!!!! TOO CUTE!!!! This is the most detailed, yet simple tutorial I have seen to make a hat like this one. I want to make one in pink for my almost-4-year-old girl who keeps cutting her hair! Hi! I love this cap! I want to make one for my daughter, but her head is only 19″… how do I adjust the sizes? This cap made my son’s Halloween costume! He loves it and hasn’t taken it off since. 🙂 Thanks for the clear instructions and very helpful photos! I have a nephew who would really rock one of these! Great job! I linked to this on my weekly roundup – post is here. Thanks!! I made this hat for every boy in our extended family (and my daughter too) two years ago at Christmas. I think we are revisiting this little cap this year as more kids have been added! Thanks again for a fabulous tutorial! Hello! I just wanted to tell you how thankful I am for sharing this tutorial! My son’s love trains and love their train hats! They were so excited to have a train hat that Mommy made! And because it is made of wool they are perfect for the winter! I was wondering if you would suggest how to make one bigger for an adult (me and my husband want one too!) and how to make it much smaller for a 1 year old. Thanks again!!!!!! I’ve made this cap for adults as well. The only adjustment I make is in the band size which I simply make bigger. Then to get the top of the cap to fit, I don’t pleat it so much. It takes a little longer and you may to do some trial and error, but overall, it’s a easy adjustment. Most adult heads are not more than 1 or 2 inches larger. Now for a one year old, you may not be able to pleat it enough to get the top to fit into the correct size band for a 1 year old. I’ve never tried to shrink it a ton, but I’m thinking you’re going to have to make the octagon smaller… maybe going in 4″ instead of 3.5″. I really don’t know if that would work though. If you do try it, please let me know how it worked out. Thanks for the nice comment. I’m glad my tutorial worked out for you! I did make one for a one-year old, and using a smaller octagon did the trick. Her head measurement is about 17 inches, so my band measurement was 19, and the octagon originated from a 10-1/2 inch square instead of 12, and I measured in 3 instead of 3 -1/2 for the corner cut-offs. This all allowed room to ease/adjust. I also adjusted the size of the bill down some to keep things proportional. Let me know if you have any more questions! Thanks for sharing your adjustments! I’m sure others will find it so helpful. 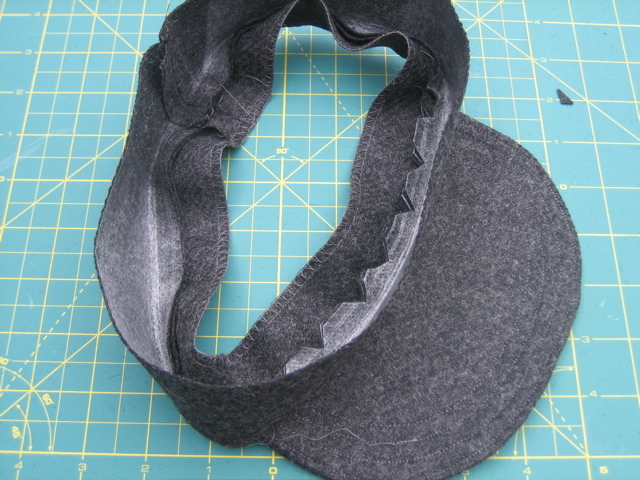 Wow, great hat – I can’t wait to see if my sewing will stretch this far. I do plan making a couple for my 2 and 4 year old boys. thank you so much!! this ADORABLE conductor hat turned out perfectly–made out of my old striped curtains–my nephew (who is getting a train set for christmas) is going to LOVE IT!!! Did you look for pillow ticking? That ought to work. You may need to iron-on some fusible interfacing on the octagon itself and the band. this was so helpful! I made one for a friend for Christmas. and your son is adorable. Wow! You are my hero! I can’t wait to try this!! Just stopping by to say how awesome this hat is! I looked at all the photos on Made by Rae’s site, and yours is my fave! Thanks for the great tutorial!! LOVE IT! I’m planning on making this for myself and putting some ruffles around inside of the brim…can’t wait! Great tutorial! Love it! I adore this. The nicest cap tutorial on the net. I made it for my son (in a sheap fabric for exercising) and my husband asked to make him also one. If you use striped blue denim it will be a Train Conductor’s hat. I made them when my sons were little and into trains. I gotta say, this struck my fancy the minute my eyes rested on it! I’ve now made three little caps for my granddaughters, using two coordinating corduroy’s with fusible interfacing sandwiched between for adequate stability, and being careful on the inside band seam, have the most adorable reversible hats for the girls! 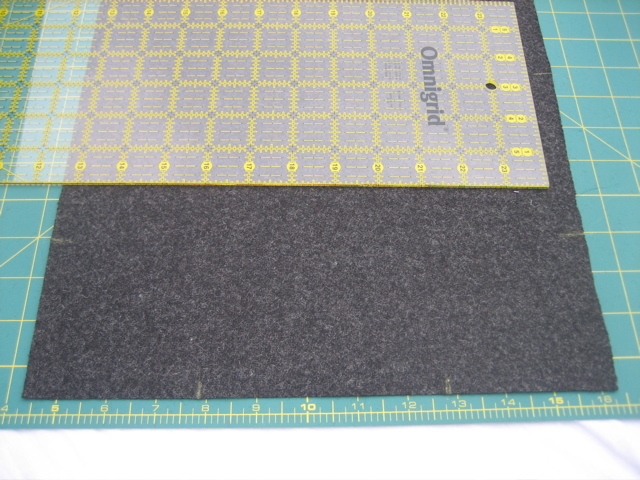 On the smallest, I also added a small piece of 5/8″ elastic inside the back of the band for snugger fit. They love them! I’m from Cape Breton Island, Nova Scotia, Canada. I made your Eddie cap for my son on his first birthday. I got so many complements on it. I understand that this pattern is for personal use only. However, I was wondering if you would sell a copyright for it or give me permission to make and sell them locally. I would appreciate if you could get back to me. You are a LIFE SAVER! We have family pictures on Sunday and I’m scrambling to get everyone coordinated and this might just save the day. Thank you SO much! A big THANK YOU from Berlin, Germany for this tutorial! Hello! I am a 1st-4th grade teacher and am putting on a play of Christmas Carol and used this design for the paupers! I used felt and hot glue and it came out just the same! I have a feeling I will be reusing these hats for everything! Hi, thanks so much for sharing! This hat is so great, and your tutorial is so thorough and easy to follow!! I wish you a very happy New Year from Germany (Hamburg) and I love your great Tutorial. Thank you so much. thank you for the tutorial. 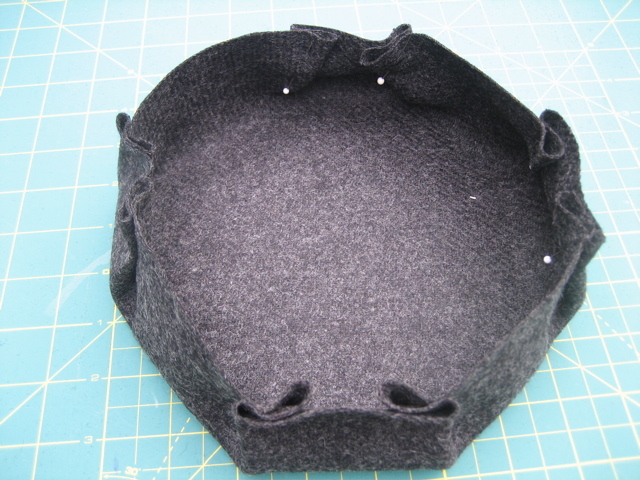 way cute….next time i make it though, im gonna shorten the brim. otherwise fantastic. I was attaching the band to the brim and had some trouble matching up without some puckers, is there a way around this. Other then that, love the project and your instructions are great! Sorry to hear about the puckers. Puckers are pests! Anyway, I found that if I pin alot or use a walking foot, I can almost always be pucker-free! Also, make sure your seam allowances are the same. Hope it works out and thanks for stopping by! Je m’en vais l’essayer d’ici peu … dès que j’ai un peu de temps libre. Le tuto à l’air facile à suivre . I features these caps on my blog! Thank You! I am making this for my son to wear with a costume! It will work perfect. While I was looking for something else, I happened across your tutorial. Lucky me! What an adorable hat. I can’t wait to try to make one for my son! Thanks so much for posting this tutorial. ~Kyla from Vancouver, BC, Canada. I have been sewing for some time but still consider myself a learner. I would not have tried this pattern before but now am confident that I could have a go at it. I have two grandsons that would love this cap. Thank you for such simple instructions. Would love to know, what is the circumference of this hat? I’m not shy about trying to modify patterns, but it helps to know the starting point without having to waste time making and measuring the original first, when that’s not what I actually want to make. Thanks for the inspiration, if nothing else! Do you have a way we can buy this tutorial for selling rights? I make little girl stuff, but I have recently had alot fo requests to make little boy items and this is cutest hat ever. I am a stay at home Mommy and I usually only sell a few items per month so it would be small scale sales. Please let me know b/c I really LOVE this hat! this is an amazing tutoial .. i followed your instructions & made a beautiful hat for my little boy from Denim!! thanx for the great tutoial. Loved this tutorial! Can’t wait to try this with a felted sweater that I am going to recycle. Thank you so much for all the time and effort you put into sharing this. This is a great tutorial. I made your hat twice and linked to your tutorial on my blog along with my adjustments (http://quitereasonable.blogspot.com/2011/12/2nd-eddie-cap.html). Thanks so much. ich habe die Mütze zum erste mal versucht, ist am Ende etwas zu klein geworden, ich komme mit den Zeichen [ ” ] nicht klar habe mich nach Bildern von dir orientiert. Vom lesen her verstehe ich es nicht, finde diese Mütze ganz toll, sie funktioniert bei uns in einem Theaterstück von 1929. Love, love, love this!! Your Eddie looks so handsome and I bet my Frankie will too in this cute cap! Any ideas for making a little guys cabbie hat? Our county fair has an restored country school on the grounds. We plan to have bonnets for the girls and caps for the boys to wear while visiting. This will be perfect for the boys. I had been thinking of straw hats, but think this is probably more authentic. 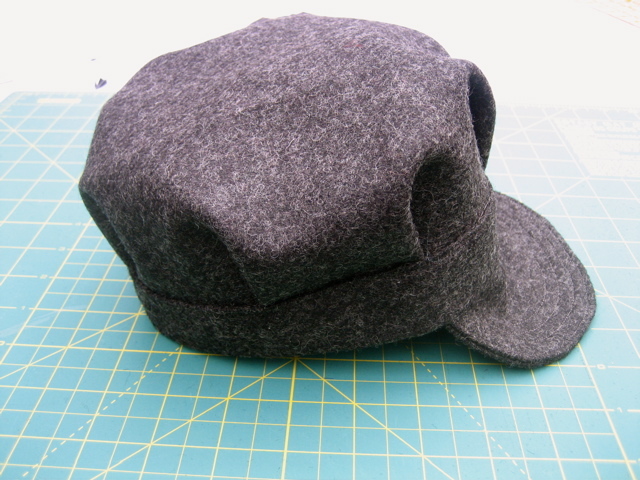 Where can I find patterns for this hat and others such as newspaper boy, Ivy league, driving cap, Gatsby flat cap, golfer cap and the list goes on. I have been searching the internet and all I am finding is ready made hats not patterns even when I googled for patterns. This hat is adorable! I will make it for my grandson, thanks for sharing. hi, just wanted to say, i really love your tutorial! it’s so very easy and looks great! good luck for future projects! Thank you for sharing. I got some fabric to make a hat for my son, and have been eagerly waiting to find some instructions. I hope to start as soon as I can measure his head! Very cool hat! Just made it and instructions are perfect! Thanks so much for the great pattern! This is a really great tutorial and great pictures! Forgot to say in my previous post that I modified it and made my Grand Daughter a Strawberry Shortcake hat for her Halloween Costume. I just made the brim shorter! It turned out really cute! Just found this and made it!! In an afternoon!!! Great tutorial and loved the finished project. I made mine orange with a black pumpkin face on it for my boy! Great photo prop for us at the pumpkin patch!! Made the second one! How many g’sons do I have?? How ironic that I found this pattern for a cap. I have been desperately searching the internet for a pattern and I found you. I will be making this very soon. Thank You! I made this one out of red felt and stitched on a red M on a white circle to make a Mario hat for a halloween costume. It came out wonderfully! This is so cute – may have to make a summer weight one as too hot in New Zealand for wool at the moment! Wonderful tutorial!! I’m sending several of these off to college with my middle daughter in the fall…she LOVES them!! THANKS! Thanks for sharing this information. I appreciate for the square caps that are found here. I have seen some major differences. In recent months, Lindsay has enough to worry about in her life. Amongst her claims are that Lohan would be appropriate to make an impression. Excellent tutorial. How should I modify the octagon size for an infant cap? | Mushroom Villagers” together with my best close friends on facebook or twitter. I actuallyjust simply needed to distributed your terrific writing! Just had to tell you I love this pattern/hat. I have made 2 now for my little guy and love how easy to follow it is. I volunteer at a teen parent center and plan to use it to teach the girls how to make them for their little ones out of old flannel shirts. I will credit you and post pictures on my blog. Just wanted to say thank you thank you!! Thank you so very much, this is a wonderful and well written tutorial, I plan to make lots of these for my friends, we run a kitty rescue train nation wide, and have conductors across the USA I think this with a kitty cat or paws fabric will be so awesome!!! 🙂 THANK YOU! I’m a very beginning sewer and I get lost when you start doing the bands part. Is there any chance that you have or will have a video tutorial for this? Thank you! Love it … I have 12 grandsons … will surely try it….. This is awesome! I am a private tutor and one of the subjects I teach is needle crafts. I have a little boy in one of my sewing classes that I struggle to find “boy things”, as he calls it, for him to do. His parents bring his two sisters over to learn crochet and he came with them the first day. I asked him if he wanted to learn to crochet too and he vigorously shook his head no. He left with his father. When they came back I asked him if he would like to do anything while his sisters were here next time. My sewing machine was set up because I was working on a quilt. He looked over to it and said that he would like to learn to sew. He was able to finish his pillow and stuff it and take it home with him that day. We have made other “boy things” over the months, and I think he is ready to progress to something a little more difficult and this is the perfect “boy thing” for him. I cannot wait to tell him what we are making next. 🙂 By the way, I made a PDF out of your instructions so I have them for future reference because I have a feeling when the other boys see this, we will be making several of them. If you would like the PDF to add to your blog, let me know and I will send it to you. Thank you for your offer Andi. I would love to add the PDF to my blog! I’m so happy to hear about your boys and teaching. Thank you so much for sharing. Plan on trying this in the morning, as I am wanting to make one of my twin boys a train conductor for Halloween. This was sort of a last minute thought and I didn’t want to spend the day out looking for a child’s conductor hat. Plus, I have tons of scrap fabric I need to use anyway. LOL! Wish me luck. I just made one out of blue and white striped fabric for my train loving nephew. He really liked it. Great design. Making one for my 27 year old daughter for the winter. She usually hates hats but loves this one! so glad this was offered again. I just now saw it. So…could I make this for my husband who loves all kinds of hats? And how much larger would the hat part have to be? I’ve figured out the band issue, I think. Your work is extraordinary for a beginner. Hope you designe more. I think I just found the courage to attempt making a hat for my grandson! Thanks so much for such a clear tutorial; both pictures and instructions. Thank you for a great tutorial. Exactly what I have been looking for. It is now number one on my ‘to sew’ list. I loved this soooooo much I couldn’t resist making two for my boys. Jayson; 2 and a half years old with head circumference of 20 and Jeremy; 4 months old with circumference of 18. LOL. They’re asleep now. Would take pics of them modeling the Eddie caps 2morrow. Want to make this for my niece who is starting chemo. Is it possible to do a print out of the instructions? Beautiful gray color! I could just hug your little boy! You should consider selling these at flea markets!! You would make a fortune! I’m a grandmother of three and a great-grandmother of one (boy)! I will send him an “Eddie Cap”, (he is two), so he can enjoy it too! The young man in your tutorial is precious. Thank you for sharing your pattern! I too will have to buy the gray wool! Jane in Georgia. Thank you, you have really helped me out! My daughter has to dress as a Victorian at school tomorrow & wanted to go as a chimney sweep with a waistcoats & cap! I’ve managed to make both tonight in a deep blue felt! Hooray! Let’s hope the hat fits!! Your tutorial is very clear. Many thanks. I think I’m going to be making more of these…. Very well written! Thank you for that. I can’t wait to make it for my grandson. I sew for my granddaughter all the time but it’s hard to find cute items for boys. Thanks again! This tutorial was just what I needed. I made this hat from a folded up piece of brown heavy spandex material. It took me two hours start to finish. And I love it! This hat is for a girl dressing as a boy in a ballet production we are putting on tomorrow. It is perfect! I can’t wait to buy some other fabrics and make some more for me and my daughters. Thank you!! So cute! Thanks for sharing this wonderful tutorial! im really interested i making one for myself. But if i make an adult size will it be still 12×12 piece for the crown? if not, what is your recommended size? And then: THANK YOU for the great “eddie cap tutorial”!! And I found it on your blog, made it in a few hours. It also will be a part of his outfit on a fifties party in the summer. With some suspenders it will be awesome! !